This very attractive George 1V antique rosewood library table is stamp marked for the London furniture makers and suppliers 'M. Willson. of 68 Great Queen Street. 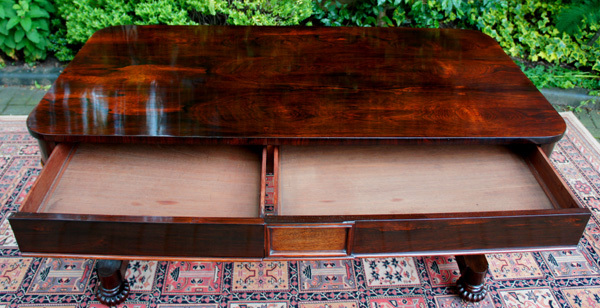 It is of superb quality and has a beautifully figured and coloured top made from timbers which highlight the beauty of the rosewood. The frieze is fitted with two deep drawers which are mahogany lined with hand cut dovetail joints. the London furniture makers and suppliers 'M. Willson. of 68 Great Queen Street'. 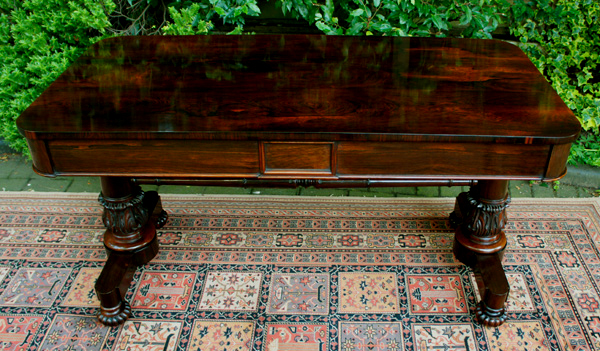 made from timbers which highlight the beauty of the rosewood. The frieze is fitted with two deep drawers which are mahogany lined with hand cut dovetail joints. The drawers open by pulling underneath and have never been fitted with handles or locks. The reverse of the table is identical to the front but without drawers. deep leaf carved collars and platform bases with gardrooned bun feet. The table also has the original brass castors. 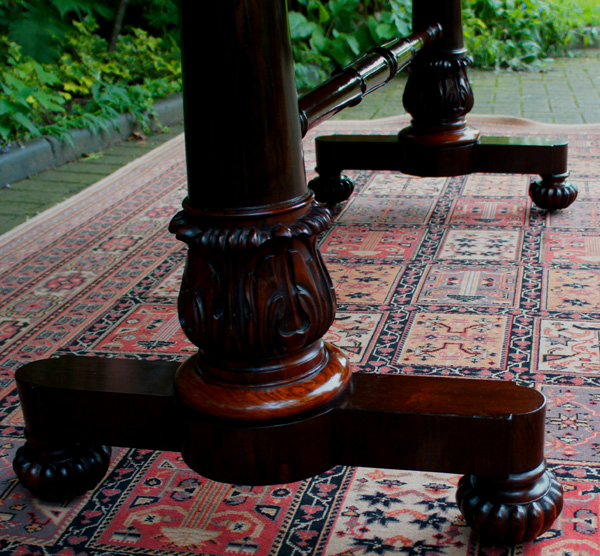 As you can see from the photos this is a very impressive table with excellent proportions. 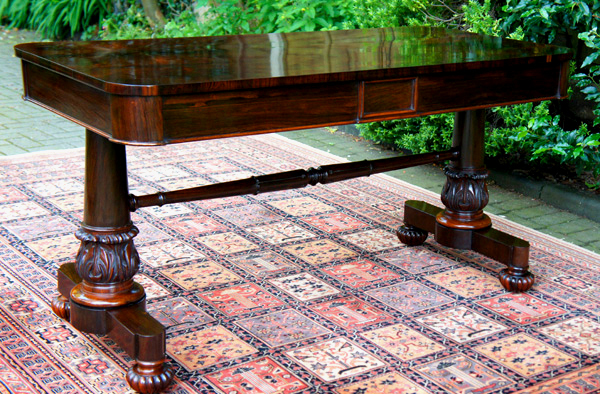 This is a very boldly designed antique table in the Regency style made to a high standard of craftsmanship. 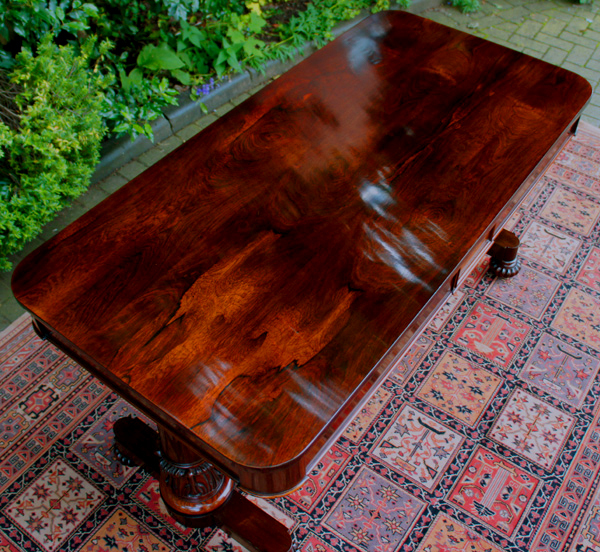 The table has recently been professionally cleaned and polished and brought back its original stunning colour. and would look stunning as a free standing piece in a traditional or contemporary setting.